With over 60 years of fashion retailing experience, River Island is one of the most well-known and loved brands on the High Street. Known for its stylish and affordable fashion, River Island stands out from the rest of the High Street through the unique touches it brings to its collections. Almost everything is designed in-house, and having one of the largest design teams on the High Street means they can have fabulous new fashion arriving in-store and online every single week. Customers can always rely on River Island for great going-out looks and occasion wear, amazing denim, and fabulous bags and shoes. It's the perfect store for picking up everything you need for a brand new look - head to toe! River Island's departments include Men and Women's fashion. River Island has 24 stores located in Ireland, and can be found on any major High Street. 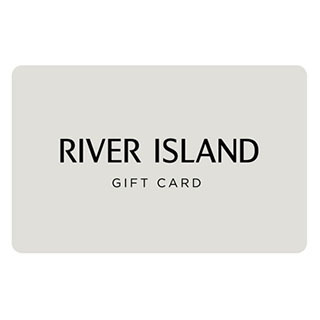 River Island eGift Cards are sent by email, normally within 3 working days.